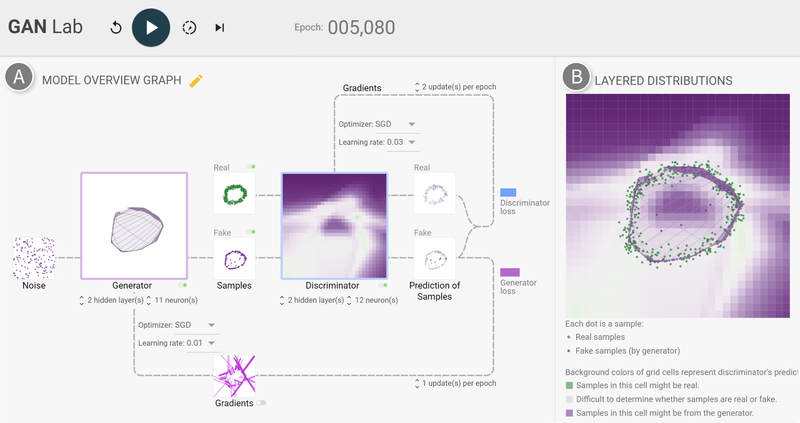 GAN Lab is a novel interactive visualization tool for anyone to learn and experiment with Generative Adversarial Networks (GANs), a popular class of complex deep learning models. With GAN Lab, you can interactively train GAN models for 2D data distributions and visualize their inner-workings, similar to TensorFlow Playground. It runs on most modern web browsers. We suggest you use Google Chrome. This section describes how you can develop GAN Lab. The watch-demo script monitors for changes of typescript code (e.g., demo/ganlab.ts) and compiles the code for you. GAN Lab was created by Minsuk Kahng, Nikhil Thorat, Polo Chau, Fernanda Viégas, and Martin Wattenberg, which was the result of a research collaboration between Georgia Tech and Google Brain/PAIR. We also thank Shan Carter and Daniel Smilkov, Google Big Picture team and Google People + AI Research (PAIR), and Georgia Tech Visualization Lab for their feedback. Minsuk Kahng, Nikhil Thorat, Polo Chau, Fernanda Viégas, and Martin Wattenberg. "GAN Lab: Understanding Complex Deep Generative Models using Interactive Visual Experimentation." IEEE Transactions on Visualization and Computer Graphics, 25(1) (VAST 2018), Jan. 2019.